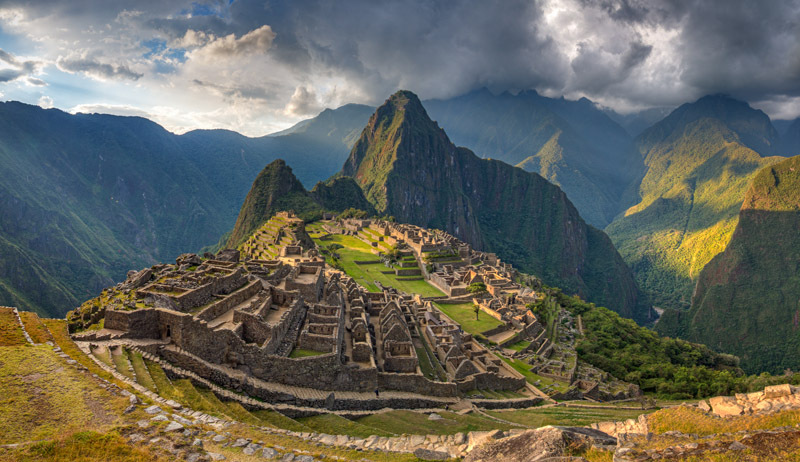 What comes to your mind when you think of Peru? Probably Machu Picchu (which is indeed beautiful). But Peru is so much more than that. You will find very high mountains (Peru has the highest mountain range after the Himallaya), deep canyons, areas of lush green, sand deserts and an ocean with lots of animals. Throw in diverse, delicious food, great architecture in colonial cities and (relatively) cheap traveling - then you talk about the country called Peru. Our first stop in Peru was the mighty and beautiful Colca Canyon. 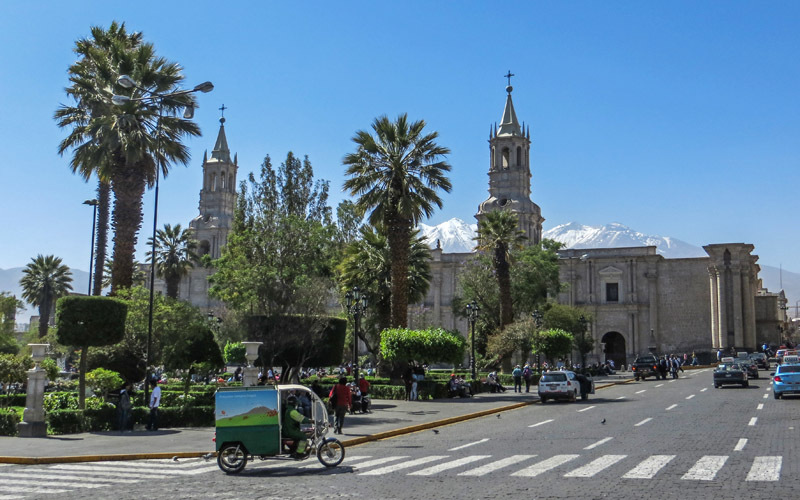 We took a bus from Arequipa to the town of Cabanaconde from where we started on a 3 day hike. The hike started a bit unusual for us - back in Tyrol (Austria) we would always start hiking upwards where as in this case the first day we descended 1200m / 3600ft down into the Canyon. We spent our first night in the beautifully located Llahuar Lodge. This Lodge has it's own 39°C natural-hot-water-pool which was a wonderful relaxation after the hiking. Additional this pool was right next to the river so every time it would get to hot in the pool we would just jump into the river. The night we went into the hot pool again to watch the majestic stars - a truly wonderful experience gazing at the milky way while sitting in the hot water. The next morning we started early on our 7 hour hike up and down along the Canyon which would take us to Sangalle - also called Oasis (for a very good reason!). A relaxing place down in the valley - lots of colorful flowers under beautiful palm trees and most importantly a pool for refreshing. 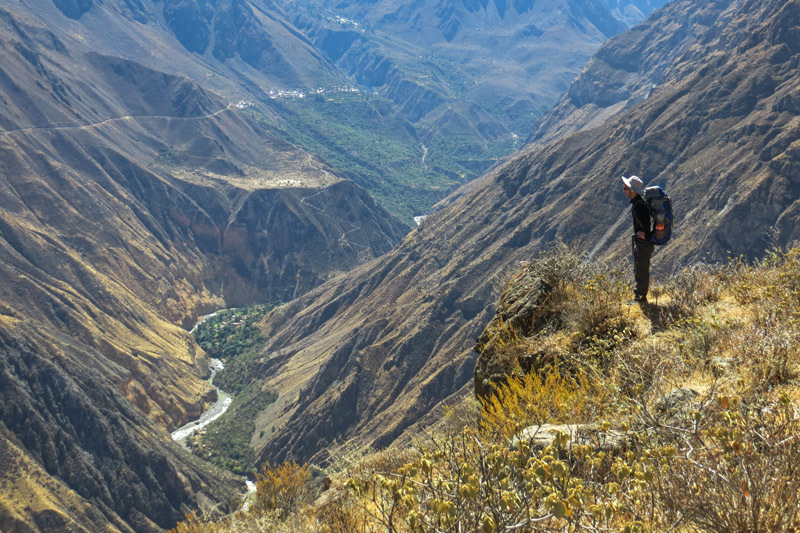 The last day we got up at 5 AM - a decision we did not regret for one second as we were able to hike up 80% of the 1000 height meters back to Cabanaconde in the shadow. We also made a trip to Tipon together - an ancient Inca site where their intelligent irrigation system is still working. It was very impressive to see how the incas perfected farming through irrigation hundreds of years ago. To get to Machu Picchu most people take the train. As the Peruvian state charges ridiculous 45 to 90 US Dollars for a one-way 90 minutes train-ride to Machu Picchu we decided we would rather walk 28km along the railroad to Aguas Calientes (the gateway to Machu Picchu) at least one way. So we took 2 collectivos in the morning to get to railroad km 82 - our starting point for the hike. The hike was very beautiful - we walked in a deep valley next to the river, saw some Inca ruins and the first third of the way was even a separate hiking trail away from the railroad. 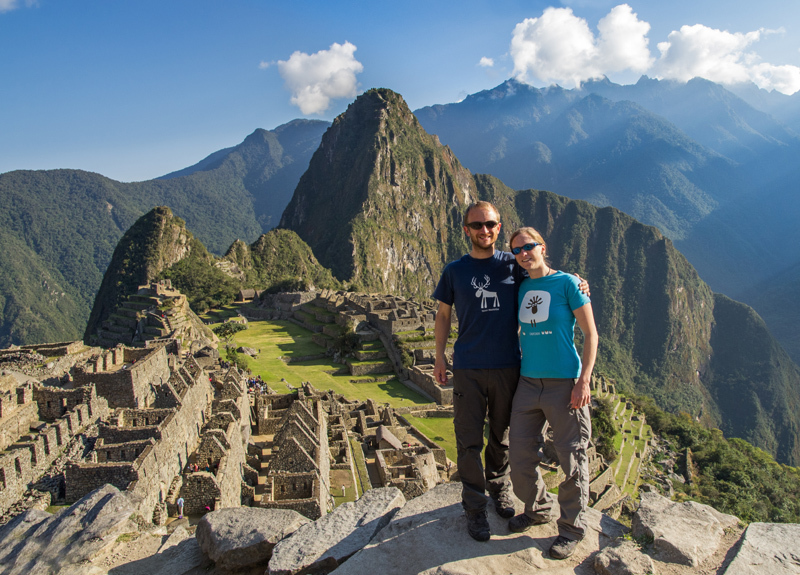 After our one-day-hike we had a rest day in Aguas Calientes and the next day we took the first bus up to Machu Picchu at 5:30 AM. No matter how many pictures you have seen of Machu Picchu - seeing it with your own eyes is a completely different experience and was so beautiful! After getting back from Machu Picchu we took a nightbus from Cusco to Nasca. This nightbus was one of the fewer ones where we did not sleep very well - the road had lots of bends and the ride was rather rough. Nasca is famous for the Nasca-Lines. Approximately 2500 years ago the people carved symbols and figures in the desert ground. These lines are still visible today and we went to an observation tower to see some of the figures. The next day we mostly spent relaxing in the hostel and the pool :-) In the afternoon we rented boards and walked up the biggest sand dune to watch the sunset and slide down afterwards. Our last stop in Peru was Huaraz - an "el dorado" for hiking and climbing. Huaraz lies next to the Cordillera Blanca - the highest mountain range on the american continent. 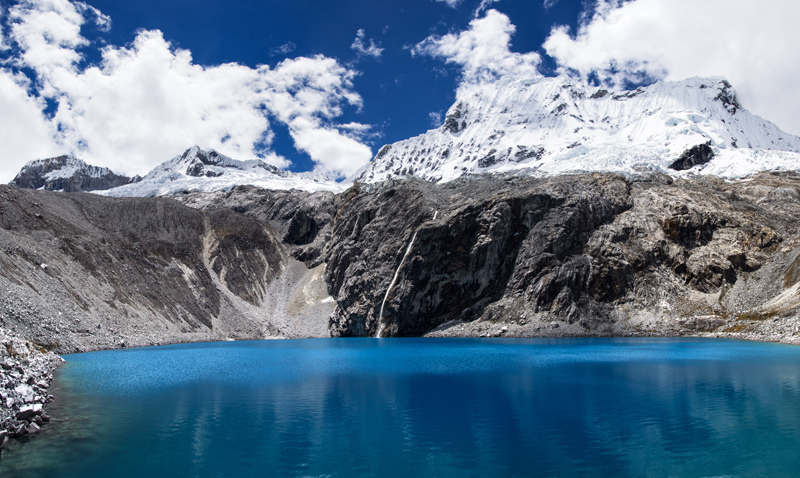 From Huaraz we started on a day-hike to the Laguna 69 - a surreal intense blue-cyan lake next to 6100m (20000ft) high peaks. When hiking in South America your starting-point of the hike is often higher than the highest peaks in Europe - in this case we hiked from 3900 to 4600m. It was one of the most beautiful hikes we did and very rewarding. The next day we went to the Hatun Machay rock forest. We had rented some climbing shoes and were looking forward to do some Bouldering. This time was one of the very very few times where we had bad luck with the weather - we actually started bouldering while it was hailing... But the rocks were so razor-sharp anyway that even with good weather we could not have climbed for a long time. So afterwards we just enjoyed the very scenic landscape and walked around / through the big rock forest. And just like that our two and half months in South-America where over and we had to say good-bye to this wonderful continent. a note on the train ticket back from Machu Picchu: "the carriage and seat number are subject to change due to an act of God or force majeure"